I didn't pamper my hair ever since I chopped-off my ponytail. It's dry with some split ends and it's screaming for help. Apart from washing and conditioning, that's pretty much the only thing I do to my hair! 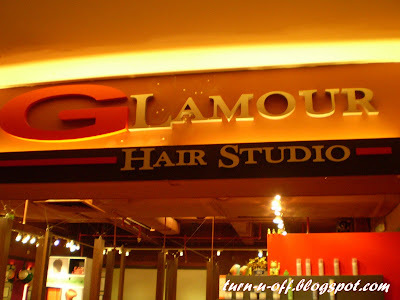 So, last Sunday mybf decided to pamper me my hair at a decent salon called Glamour hair studio and he was willing to sit there and wait for me until I get my hair fixed. He has also promised the hair stylist to bring me back after one month for another treatment! 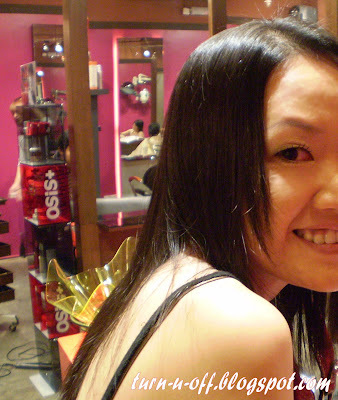 That's the professional hair stylist (at the counter) who trimmed my all-one-length hair (I hated it) layered. I'm not sure about you but I preferred male hair stylists. I love the way he waved his scissors like a samurai through my hair! Bet your BF very pleased with your new exciting looks, huh? Have fun, you sure look beautiful...Monica...Lee. Hey, actually its a big step to take to cut off a long hair to short. Am sure ur BF likes it too. My hair is in so bad shape that no amount of professional help is going to work ... LOL!